As all true romantics know, romance and memories can flourish anywhere, not just in an historic setting. Castleford Civic Centre has a well-deserved reputation as a modern and vibrant venue that has at its heart a spectacular and highly flexible 500 capacity atmospheric auditorium. This is what makes it an outstanding choice for a wedding breakfast, evening reception or private celebration where large numbers of guests are anticipated. The Legioleum Room, named after the original Roman term for Castleford, is perfect for those looking for a cosy and adaptable space for an a more intimate celebration, with a capacity of 80. Castleford Civic Centre lends itself to multicultural weddings, receptions and celebrations with a great location and capacity limits. 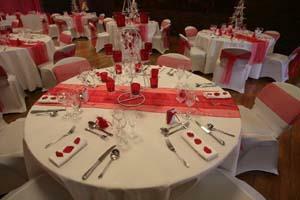 This venue offers flexibility in choice of rooms and a range of facilities to accommodate large celebrations. Our Events and Functions Team will be dedicated to making your day special. For more information please contact the Events and Functions Team on the details below. Castleford Civic Centre is located off Junction 32 off the M62. Follow the brown tourist signs for Castleford Town Centre and the Civic Centre. Castleford Civic Centre is approximately half a mile from Castleford Train Station and Castleford Bus Station.